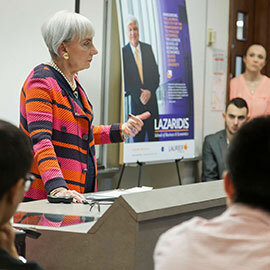 Maureen Sabia, Chair of the Board at Canadian Tire, spoke to more than 100 students and faculty members at the Lazaridis School of Business and Economics Oct. 28 as part of the Lazaridis School’s CEO-in-Residence series. Sabia urged the students to become leaders in their professions by valuing their integrity above all else, noting, "You won't succeed unless you're trusted – remember, you need to get your calls answered." Recalling an hour spent with one of her personal heroes, former British Prime Minister Margaret Thatcher, Sabia told the crowd she admired Thatcher's strength and determination despite tremendous adversity. "Doing what is right is the essence of leadership – and it takes courage," said Sabia. She urged her audience to develop a clear vision of their success and a single-minded focus on realizing that vision. Calling discipline her "comfort zone," Sabia warned the students that becoming successful is tough, that "it is the reward of struggle," and that "there is no such thing as a balanced life unless mediocrity is your goal." Dean of the Lazaridis School, Micheál Kelly, who introduced Sabia, noted her long list of honours, including an Order of Canada, two honorary doctorates – one of which was from Laurier – and making the Women’s Executive Network’s list of Canada's most powerful women in 2009. Sabia urged the women in the audience to reject the idea of gender equity quotas, saying that she didn't need "that kind of help" even though she was one of only three women in a class of 300 while earning her law degree at the University of Toronto. She suggested that, as graduates, the students should develop a "yes, I can" mantra and take responsibility for their own success. Sabia concluded her talk by urging the students to be curious, disciplined and to invest in their networks. She noted the importance of developing a style and a presence, as well as a reputation for personal accountability. Finally, she told the audience not to make hard and fast plans for the future, but to remain open to unexpected opportunities and risks that might come their way.